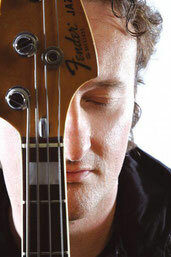 Born in October 1969 Peter Muller grew up in a musical family. His father played acoustic bass and piano and so Peter came into contact with Jazz very early. After learning classical acoustic guitar for some year his ears were suddenly totally drawn to the sound of the bass and he started to slap on his guitar, trying to sound like all the contemporary bass players he was hearing, like Mark King, Stanley Clarke and Marcus Miller. At the age of 14, his parents helped him out in buying him a second hand Fender Jazz Bass (Serial No. S8852622) that is still his main instrument today. In just 4 years he learned to play the bass well enough to become a professional musician. Like most professionals he played all kinds of gigs in all kinds of settings all over Europe. Peter became a popular sideman, favoured for his heavy groove and his passion for funk. In the 90`s he discovered his composing skills and began to write his own music. He also felt that producing music could be an interesting new perspective for him, so he started recording on the computer in the early days of hard disk and digital recording. In 2000 he became member of the Frank Mead Band, which was an important step in his development as an artist. In 2001 he put his own studio, “Wave Island”, together and it was only a few months later that he decided it was finally time to release his first album. He founded his own label "Mullennium Records" to have the complete freedom and control over his music. His debut CD "M-Vibez" was released in July 2003 and became an unexpected success. Despite limited marketing possibilities and budget, the record received rave reviews in Bass, Jazz and Hifi-Magazines and finally got some jazz chart entries in several countries. Until today people have been discovering Peter's debut CD, which meanwhile has become a real "bass classic". In the following years Muller stayed busy as a much sought-after bassist, as well as an audio engineer and producer, producing music for other artists. As the vision of a second album became stronger, so Muller started to back out from other activities and concentrated solely on his second album "The Flow", which was finally released in January 2008. Just like the debut, it made it's way into the most important magazines and was listed several times in the iTunes Jazzcharts. 2009 Peter reduced his activitites as an artist, took a well deserved time-out and did a lot of travelling. After that he worked mainly as a bass and music teacher and was also doing studio projects once in a while. Through his activities in music education he entered into the management of a Rock and Jazz school and worked there for about 3 years. At the end of 2012 he left this position to begin a new creative period. The works on the new album "No Mind" started in spring 2013. Muller organised recording sessions in London, Berlin, Hannover and other places between fall 2013 and summer 2014. Most of the musicians from his previous albums were available again and also some exciting new co-operations started. Finally Muller mixed and mastered his new album "No Mind" in September 2014 and the release was scheduled for November 2014.